The group of Bert Weckhuysen and Pieter Bruijnincx has managed, together with colleagues in UK and in the US, to speed up the processing of biomass into a variety of valuable renewable products such as plastics and fuels. The key is a newly developed reusable catalyst: a compound that both supports and controls the reaction. This results in a greater yield of valuable chemical building blocks from biomass but also in fewer by-products and less waste. The researchers have already applied for a patent for their invention. The research was carried out as part of the public-private partnership CatchBio, which conducts research on clean ways of processing non-edible biomass. The results will appear this week in the scientific journal Nature Communications. Image description: Electron microscopic image from the new catalyst that is based on the metals Ruthenium and Palladium, shown as gray/white sphere. On the right an enlargement of the catalyst; the pink globules represent Ruthenium and the blue globules represent Palladium. The molecule levulinic acid (left) is processed into γ-valerolactone (right). By 2050, some three-quarters of the world’s population will be living in cities. The growing number of cities with over a million inhabitants and major conurbations (such as the ‘Randstad’ in the central -western Netherlands, which includes Amsterdam, Haarlem, Leiden, The Hague, Rotterdam and Utrecht) is demanding more of sustainable and closed loops for a good living environment. Chemical building blocks derived from biomass can form a significant contribution to the increasing demand for sustainable materials and fuels. In this case it concerns non-edible and fast-growing biomass such as straw, foliage and wood. During the processing of biomass, a select number of chemical building blocks form that serve as the basis for the production of a wide range of renewable chemicals such as plastics, fuels and solvents. These subsequently form the base for fuels and materials that people use in everyday life, ranging from drugs to clothes. In order to stock the world population in the future in this manner it is necessary to get as much yield from biomass as possible. Catalysts are crucial in this biorefinery process and their optimisation will have a major impact. The public-private partnership CatchBio (‘Catalysis for Sustainable Chemicals for Biomass’) was established in 2008 and comprises 21 partners from Dutch universities, research institutes and industry. 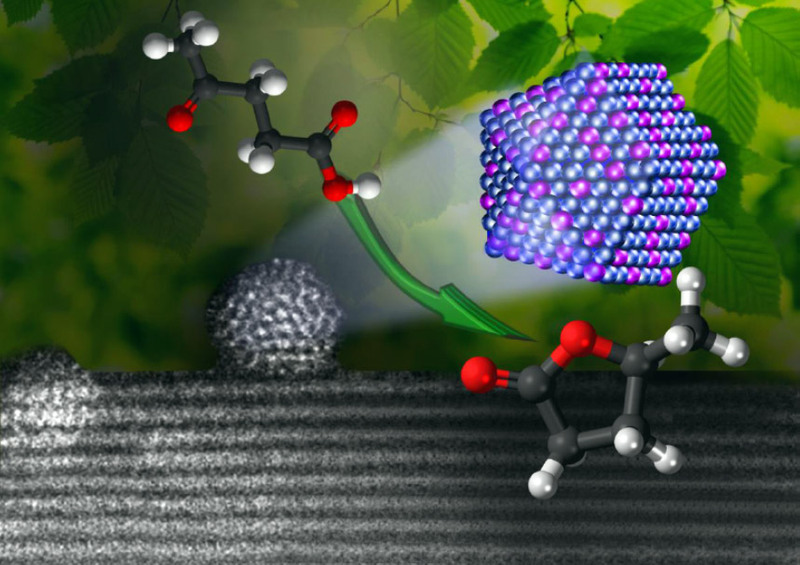 It aims to recover fuel, chemicals and other materials from non-edible biomass in a clean way. The partnership involves more than 60 research projects with a total budget of EUR 28 million, contributed from the participating companies and research institutes as well as from the SmartMix programme of the Ministry of Economic Affairs. ‘High Performing and Stable Supported Nano-Alloys for the Catalytic Hydrogenation of Levulinic Acid to γ-Valerolactone’. Wenhao Luo, Meenakshisundaram Sankar, Andrew M. Beale, Qian He, Christopher J. Kiely, Pieter C. A. Bruijnincx, Bert M. Weckhuysen. Nature Communications, 6 (2015) 6540. DOI: 10.1038/ncomms7540. ‘Supported Monometallic and Bimetallic catalysts for the Hydrogenation of Levulinic Acid’. News coverage The European Synchrotron Radiation Facility (ESRF) in English. News coverage Chemisch2Weekblad (C2W) in Dutch. Highlight in Chemie Magazine in Dutch. News coverage ScienceGuide in Dutch.